For years, the Internet has been engaged in an arms race to see who can inject bacon into the wildest foodstuff. 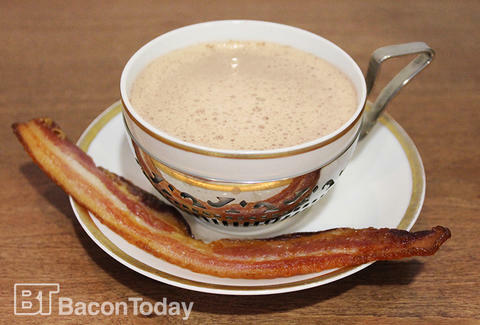 There were bacon burritos, and bacon cannolis, and now, we finally have the answer to PSL fatigue in the bacon spice latte, created by our friends at Bacon Today. The BSL has all the cinnamon, nutmeg, and allspice you'd expect in a fall drink, but it takes Boss Hog’s Maple Bacon Coffee as its base and also mixes in Torani Bacon Flavoring Syrup for an extra pork-tinged edge. Any aspiring Swansons should further serve this with a strip of bacon on the side, or perhaps two, in case you need an extra stirring stick. Enjoy it while it lasts, friends, because in just another week or so, we'll be firmly entrenched in eggnog season. Kristin Hunt is a Food/Drink staff writer for Thrillist, and thinks all cups of coffee should be served with a strip of bacon. Follow her to discarded biscotti at @kristin_hunt.